Former SADiE developer Joe Bull has a knack of spotting gaps in the market, and launched JoeCo to develop multitrack recorders for capturing live shows. Rugged, super-reliable and compact, JoeCo's BlackBox Recorders come with a range of I/O options that allow them to hook into mixer insert points, digital outputs or mic splitters, and have become the de facto industry standard in some quarters. The BlackBox Recorders are stand-alone devices, so it was a logical development to launch the BlueBox Recorder. This too can record and play back 24 tracks of audio to and from local media, but adds, among other things, the ability to serve as a USB audio interface for Mac OS and Windows. I reviewed the BBRW24MP in SOS May 2017; considered as an interface for studio use, it makes an intriguing alternative to the familiar choices. 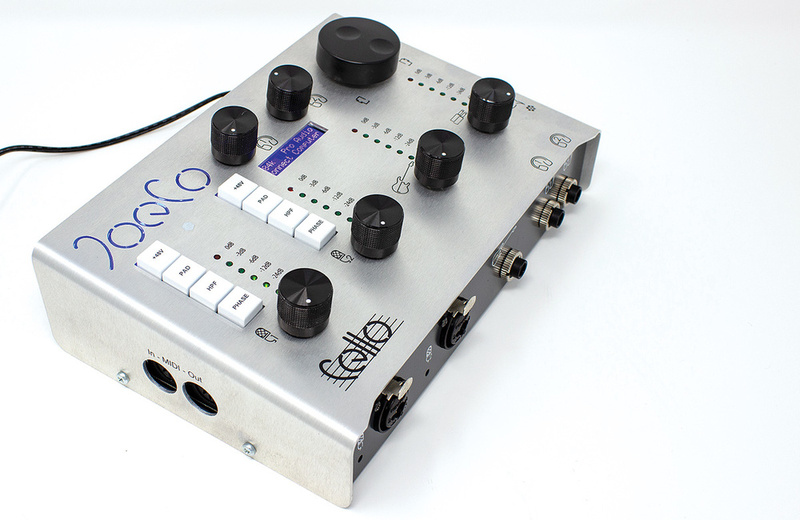 Emboldened by that success, Joe and his team have now created the Cello, a desktop USB interface designed for home and studio use. On paper, its feature set looks much more conventional than that of the BlueBox, boasting two mic preamps, a high-impedance input for guitars, a pair of headphone outputs and monitor control functionality amongst other things; but, as we'll see, there are still respects in which the Cello differs from its peers. One aspect of the Cello that immediately marks it out as different is its industrial design. It occupies a chunky brushed-metal housing and offers hands-on control courtesy of chunky retro knobs and attractive 'Opal fruit' buttons with integral LEDs. Further visual feedback comes from six-segment LED ladder meters embedded into the top panel, and a two-line text display that looks as though it belongs on a sampler from 1989. Taken as a whole, I think it works well, making a bold visual statement whilst feeling very robust and substantial. My only slight reservation is that the buttons don't feel as good as they look. The tiny on/off switch on the Cello's rear panel is an unusual momentary affair rather than a conventional toggle, but the unit itself leaves you in no doubt as to whether it's powered up. In theory, the Cello can run on bus power, but an additional 5V power supply is included in case your computer can't supply enough juice. My MacBook Air failed dismally on this front, and I was only able to use the Cello with the external PSU. This is inconvenient, as it's a wall-wart affair that comes with a cable only 1m long. Cello, Is It Me You're Looking For?